There are some situations or health issues that can create a lack of sleep. For a good healthy body and mind, a person needs to have a good sleep. A human body needs an approximate of 7 hours of sleep to be healthy. Lack of sleep can lead a person to a depressed level, which can be dangerous for his / her life. It is proven that when a person sleeps according to the needs of his / her body, then he/she seems to be active whole day without any issues. Most of the people take sleep for granted because it seems as having a proper sleep which a human body needs every day, can be sacrificed for some other purpose. There are even people who think that sleeping is for lazy people and if a person needs to be active then they need to make use of their sleeping time in a productive manner. Therefore, to avoid such confusion a person needs to fix a time which can lead a person to go to sleep without any extra thoughts. A person who exercises daily and feels tired at the end of the day may fall asleep very early because of his / her tiring day routine. Exercise is a habit that can lead a person to a level where he /she can feel healthy and tired at the same time. As per human nature, a person feels tired when he/she works the whole day without any rest. But in this mechanical life, a person works according to the machines around him/her which makes working easy and human body gets plenty of rest time during such a working environment. There is a lot of food which prevents a lack of sleep. And the consumption of such food and beverages can be harmful for a human body. If a person needs to better sleep at night, then he/she need to avoid excess intake of such foods and beverages which can turn things worse. These teas and coffees provide certain energy to the human body that can lead a person to be active while working a certain task. Therefore, avoiding such food and beverages can help a person sleep better at night. Most of people have a bad habit of watching TV till they fall asleep. At times It happens to experience that a person fell asleep watching tv and forgot to switch off the TV. All these kinds of habits are not harmful as it has been a routine, but eventually, it will turn itself into a big problem that can lead a person to be dependable on such devices to get some sleep. Sometimes it happens that when a person had a very good sleep at night, it is possible that he/she may be feeling snoozing during a certain time of the day. Then at that time, a person needs to have a small nap of about 20 minutes and not more than that. These 20 minutes of nap provides productive energy to a human body that can be indulged in a productive way. It is healthy to have a small nap during a certain period of time and it also helps to be active during working hours. Excess sleep can lead a person to a level where he/she can be lazy and inactive with their daily routines. And to avoid such excess sleeping habits a person needs to alarm himself/herself for a certain period of time when that person feels sleepy during working hours. Whenever a person uses such alarming system to wake himself/herself of sleep, then it is possible that he/she may end up being responsible about the work which needed finishing deadlines. The reading habit is one of the habits that can lead a person to have a good night’s sleep, where he/she can use their energy to read some books which can eventually get them tired and let them sleep in a better manner. Most of the people who think that reading can be boring, they should start reading books at night so that they sleep better at night. Therefore, reading books can help a person to sleep better at night. Most of the people commit such a common mistake which is not necessary to be followed, but because of some stupid craving habits, people tend to lose their sleep at night. Some people try to have dinner which is not proportionate to their body and some have their dinner which is over proportionate to their body. Therefore, it is very important to understand what food and beverages are healthy to be taken at the time of dinner to avoid a lack of sleep. Most of the time it happens that because of such bright lights a person ignores his / her sleep. Therefore, it is better to use such lights which is soothing to eyes and which can ultimately turn oneself to sleep better at night. These all habits can make one person sleep better at night without issues or problems. And it also helps them to be more active in the morning because of their good night’s sleep, which leads to be active every day. Music is one of the best ways to sleep better. It helps to calm the human mind and body. Most of the doctors who treat such lack of sleeping problems prefer suggesting music than medicines to sleep better at night. If a person who is suffering through insomnia or sleeping problem, then it is better that he/she should start listening to soothing music which can automatically turn oneself to sleep better at night. When a person is suffering from the sleeping problem a doctor may suggest or prescribe them a certain amount of sleeping tablets to sleep better at night. Because a human body needs rest from the work they delivered that particular day. 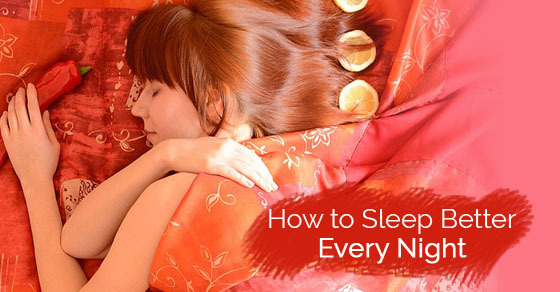 Therefore, it is necessary to sleep at night to have a healthy body. It is not necessary that a person needs to follow such a prescription every day. Such a prescription can be followed accordingly once a person starts sleeping better at night without such tablets. A person who needs a healthy body has to follow a healthy procedure of fluid intake which is necessary for a healthy human body. A human body requires a certain amount of liquid intake that can turn things or elements healthy for the sake of better health and sleep. Such balancing of liquid intake can create a level of healthy intakes where a human body can gather a certain amount of energy for the next day’s work. For a healthy sleep, a person needs to understand a common thing that he/she needs to sleep in a position in which they can sleep better at night. There are people who sleep in such weird positions that they end up gaining pain from their sleep. Therefore, it is necessary to sleep in a better position so that they can sleep better at night. And the bottom line is that lack of sleep can be measured in terms of depression or diseases which can be named as insomnia. If a person loses his / her sleep because of some issues and sleep disorders, then he/she needs to solve such issues which is preventing sleeping problems. And if a person is suffering through some insomnia problem, then they should meet concerned doctors for insomnia treatments. Therefore, it is better if a person follows all the above-mentioned tips and tricks that can help him/her to sleep better every night.